NEW DELHI / MUMBAI: The so-called swadeshi lobby is getting active and aggressive too. Having successfully made the Star News case as a swadeshi vs. videshi issue, the Indian media companies now want the government to get tougher on all media-related issues (shades of the erstwhile "Bombay Club", which was made up of some of the stalwart companies of the old economy). The Indian Media Group --- is it a new front for the swadeshi bandwagon? --- comprising leading media personalities including many publishers and broadcasters, met today to discuss the issue of foreign direct investment (FDI) in media and has decided to petition the government on this. 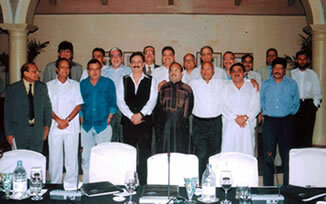 From left to right (Front Row): Vijay Jindal (The Times of India), Ramesh Chand Aggrawal (Dainik Bhaskar), Ashoke Dasgupta (Aaj Kal), Subroto Roy Sahara, Amar Singh (director, Sahara India), Mahendra Mohan (Dainik Jagran), Ashwini Minna (Punjab Kesari), Atul Maheshwari (Amar Ujala). From left to right (Back Row): Markand Adhikari (SAB TV), Aroon Purie (India Today Group), Subhash Chandra (Zee Group), Shardul Vikram Gupt (AAJ Group), JB Roy (Sahara Group), Prabhu Chawla (India Today), Manoj Santahlia (New Indian Express Group), Lalit Suri (Mid-Day Delhi), Jawahar Goel (Zee Group), G Krishnan (Aaj Tak), Sumit Roy (Sahara Group). In a related development, the IMG released a list of 83 members of Parliament (MPs) who support the "desi" lobby in its demand for the setting up a regulatory body for the broadcasting industry. The fact that all the MPs who signed were from the opposition appears to indicate that there will be much heat raised around the issue in Parliament. The meeting of the IMG, held under the chairmanship of Sahara group managing director Subroto Roy, has resolved to approach the Indian government to make the policy guidelines more stringent and rugged to "prevent any manoeuvring and manipulation." The list of attendees is tells a tale. Those who attended the IMG meeting included Aroon Purie (India Today Group), Ashok Dasgupta (Aajkal), Ashwini Minna (Punjab Kesari), Atul Maheshwari (Amar Ujala), G Krishnan (Aaj Tak), I Venkat (Eenadu TV), Jawahar Goel (Zee), Mahendra Mohan (Dainik Jagran), Manoj Santhalia (The New Indian Express Group), Markand Adhikari (SABe TV), Prabhu Chawla (India Today), Ramesh Chandra Agarwal (Dainik Bhaskar), Shardul Vikram Gupt (Aaj), Subhash Chandra (Zee), Vijay Jindal (Times of India), Lalit Suri (Midday-Delhi) and Pronnoy Roy (NDTV). A significant "absentee" from the list is Shobhna Bhartia or anyone else from her print publication Hindustan Times. This is bound to further stoke rumours of a possible alliance between Star India and HT. While allowing FDI in the media, major control of the media should continue to vest in Indian hands, IMG is of the opinion. · There should be one uniform and comprehensive media policy for foreign investment with respect to print, television and radio wherein foreign investment is capped at 26 per cent. * The government should institute a regulatory authority to administer the media policy and handle all complaints. * To avoid de facto control by a foreign company, 51 per cent of the right should vest in one Indian family/group--- as done in the FDI guidelines for the print medium. * Foreign held companies should submit to the Indian jurisdiction both in terms of income tax guidelines and other laws pertaining to libel. * The government must implement CAS in the interest of the consumers and the viewers. * All activities relating to broadcasting whether it is content creation, distribution or overall management should vest with one licensed company. It was felt that since media is an activity governed by Article 19 (1) (a) of the Constitution of India, the government should probe the source of funding in order to detect the real control as opposed to proxy control by Indians acting as decoy shareholders for the foreigners. The group also highlighted that there are restrictions on media control by foreigners worldwide. The test of control should be the sole parameter for FDI in Indian media. The Group emphasised that even though they are open to competition by foreign media / investment, the foreigners must comply in both letter and spirit with the Indian rules, laws and regulations. The Group felt that since Indian companies are not allowed to distribute their content in foreign countries, then why should the foreign companies be allowed free and unfettered distribution of their content in India? Any discrimination, if at all, with regard to media ownership privileges and rights should be in the favour of Indians. The IMG felt that the government's FDI policy in media has resulted in more outflow than inflows. Therefore, justifying any foreign investment in India on grounds of foreign money inflow to India is unfounded and incorrect. With this being the first meeting of the Group, the next meeting would be held soon to reflect on the broad contours and salient features of the Indian media policy. It would submit a revision paper to the government soon that will help in the conceptualisation of a uniform and comprehensive media policy.